Every year there's at least one...an album that gets glorious reviews upon first release, but then for one reason or another is all but forgotten when the critic's year end lists come out. Usually it's the "dark" factor, as in the album was too dark, as was the case for Mark Lanegan's Bubblegum in 2004, or not dark/edgy enough (also known as "too country"), as was the case for Howe Gelb's 'Sno Angel Like You and Rosanne Cash's Black Cadillac in 2006, or Patty Griffin's phenomenal Children Running Through in 2007. In 2010, that album was unquestionably Anais Mitchell's one-of-a-kind Hadestown. Originally staged as a musical, also written by Mitchell, Hadestown takes the classic Greek myth of Orpheus and Eurydice and recasts it in depression-era America. The supernatural elements of the myth still exist, but Hades is now more industrial robber baron than god, Hermes more the sly,whispering street shyster working back alleyways than gilded-heeled messenger, the river Styx is now a train depot, and Orpheus is basically an untroubled Hobo whose faith in the earth and the kindness of strangers to provide is what drives the poor, more practical Eurydice into Hades arms. It's a brilliant shift in perspective, allowing Mitchell to use the myth to make all manner of metaphorical allusions to contemporary society (as in the byzantine politics of personal work-life entrapment set forth by Hades in Why We Build The Wall), and opening the record up stylistically to the full rich history of 21st century Americana. There's earthy, Woody Guthrie-styled folk (Wedding Song), raunchy, late night blues (Our Lady Of The Underground), Pointer Sisters-styled call and response (When The Chips Are Down, Nothing Changes), rousing street choruses (Way Down, Hadestown), aching ballads of regret (Flowers, I Raise My Cup To Him), and jazzy flourishes (several of the album's interstitial tracks). Further serving the narrative, Orpheus's key songs are given a more traditional Brit-folk flavor, lending his tracks an otherworldy, virtuous feel which helps to isolate his character from the wanton American earthiness that dominates the rest of the record. But Mitchell's final masterstroke was in recruiting some of the finest voices in contemporary indie to play opposite her Eurydice. From Petra, Rachel and Tanya Haden as the Fates to bottom-of-the-ocean baritone Greg Brown as Hades, from The Low Anthem's sandpaper-voiced Ben Knox Miller as Hermes to Mitchell's personal mentor Ani DiFranco as Persephone, each guest vocalist seizes their moment, delivering near-definitive renditions of every one of these songs. And first among equals is undoubtedly Bon Iver's Justin Vernon, who crushes every song on which he performs and quietly dominates the album. It is, quite simply, the best work he's done since his own magical 2008 debut, For Emma, Forever Ago. All and all, a remarkable record...maybe a hair too tastefully restrained at times (which I think was probably its undoing with respect to the critical year end lists), but as rich and varied and unique and narratively clear as anything that's come out the last few years. It fades a bit in its final fifth, when its stage production origins finally rear up and sap some momentum, but up until that point, the rollicking first third, and the long, tremendously moving middle stretch are so worth the price of admission, I cannot bring myself to give this album anything but the most enthusiastic of recommends. Don't let those forgetful critics prevent you from experiencing one of the best folk albums in ages. Cherry Picker's Best Bets: Wedding Song , Way Down Hadestown , Wait For Me , Why We Build The Wall , Flowers (Eurydice's Song) , If It's True , Epic (Part Two) . Here's a live solo performance by Mitchell of Flowers (Eurydice's Song). 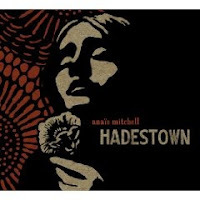 What are your thoughts on Anais Mitchell's Hadestown? Let readers know in the comments section below.